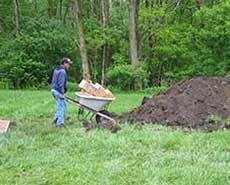 JCAM holds an annual Book Burial each spring at the King Solomon Memorial Park cemetery in West Roxbury. JCAM collects thousands of worn out siddurim (prayer books), Torah scrolls, tallism, tzitzit, tefellin, and other sacred materials containing the Hebrew name of G-d each year from the local communities, synagogues and organizations. The materials are stored at our new community Genizah (book depository) located at the Sons of Abraham Chapel on the Baker Street Cemetery. We sort the materials and those found in perfectly good condition (right) are placed on our bookshelves in the Genizah. The rest are buried according to Jewish law (below). Call us at 617-244-6509 ext. 103 to make an appointment during normal business hours to drop off your sacred materials (Shemot). We ask for an $18 per box donation to help us defray the cost of sorting, transporting and burying these sacred materials. Objects which are used for holy purposes acquire a holiness themselves. Depending on the particular use, there are guidelines for how to treat and dispose of these objects. Books are first and foremost to help the living. 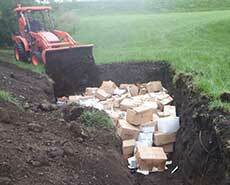 Materials in perfectly good condition should not have to be buried. New and slightly used books should be offered to synagogues or schools, donated to libraries, senior centers, etc. We do not want to be wasteful with consecrated space. Only when no other use can be found should it be brought to the Genizah located at the Sons of Abraham Chapel on Baker Street, West Roxbury. JCAM takes the responsibility for the burial of Shemot, which include Torah books, Bibles, scrolls, benchers, tefillin, talitot, mezuzot, Torah mantles/sashes (and any items that have been in direct contact with a Torah scroll). Pages or papers with Torah portions and/or the Hebrew name of G-d are also considered holy and we ensure that these items are treated with the respect our tradition accords them. Schoolwork, homework and test papers may be considered holy objects if they contain God’s Name, Torah laws or 3 consecutive words of Torah. These are considered sacred and should be brought to the Genizah in appropriate containers. Please do not put anything in plastic since it is not biodegradable. 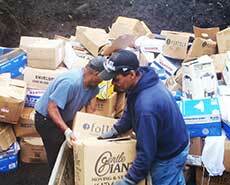 JCAM will not accept any materials that have not been properly sorted prior to drop off. Cardboard boxes are fine. We treat the materialsas we do the human body--with dignity and care. Just as we bury bodies to be returned to dust, so it is with the Shemot that is brought to the Genizah. Objects in this category must be disposed of in a respectful manner but do not need to be buried. Things such as tallit or tzitzit (after the fringes have been removed for burial), tallit bags and the 4 Species used at Sukkot…should be double wrapped in paper or plastic and disposed of before bringing them to the Genizah. The Genizah is not a depository for personal items, personal mail, such as calendars, newspapers, solicitations, magazines, or school papers, unless the Hebrew name of G-d or Torah portions are found within them. It is not respectful mix these items with sacred materials. Such items as: Kippot, audio/visual materials, computer disks, diagrams or pictures without text and stories and newspapers that do not contain sections of Torah need not be brought to the Genizah. There are other items which technically may not have the status of a holy object, but one may feel that they should be treated respectfully, such as pictures of holy individuals. These such items should be disposed of in a respectable manner. For example: Wrapped in paper or plastic before being placed in the trash. 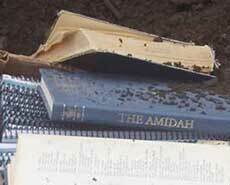 When the Genizah is filled, JCAM arranges the burial and provides the land. There are costs to JCAM that are involved in opening and closing the grave.For this reason, JCAM asks participating congregations and individuals for donations to help defray the cost. We recommend a donation of $18 per box. Donations should be mailed to our office payable to the JCAM Charitable Foundation. PLEASE DO NOT LEAVE ANY DONATIONS AT THE CHAPEL. The Sons of Abraham Chapel, located within the very end of the Baker Street roadway. PLEASE CALL THE JCAM OFFICE AT 617-244-6509 DURING REGULAR BUSINESS HRS. TO MAKE AN APPOINTMENT AHEAD OF TIME. NEVER LEAVE ANY MATERIALS OUTSIDE THE DOORS OF THE GENIZAH AT ANY TIME! NOTE: JCAM provides this service to the Greater Boston Jewish community. If you live outside of Massachusetts, please contact a funeral director, cemetery or synagogue in your area, please contact them to assist you in disposing of sacred materials properly. The JCAM Charitable Foundation is a 501c3 corporation. All donations are tax deductible.